Shrek getting tired of his domesticated life. Shrek making a deal with Rumpelstiltskin. 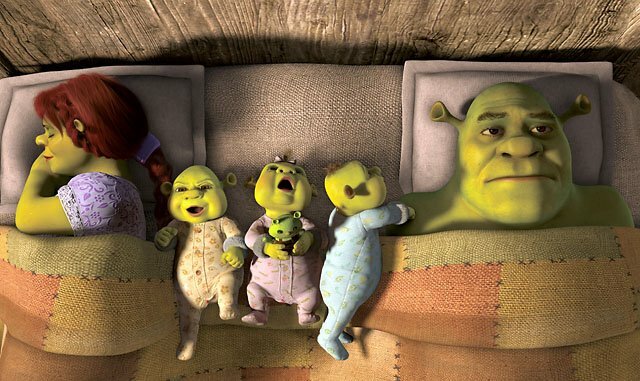 In the movie, Shrek was surrounded by a loving family, best friends, and adoring villagers, but he gave up all of these for just a day to be back to his old self. We sometimes do the same. We exchange long-term happiness for a moment of pleasure. We exchange our greatest treasure for a minute, tiny, microscopic piece of gold that life offers us. We give away everything that we have and everything that is important to us for something that is not even worth it. Last Sunday at the South Feast*, Bro. Arun talked about living deliberately. Let us not make unworthy deals and regrettable exchanges. Let us not just accept what life brings us but learn to choose wisely. Everyday, we are confronted by life's tests. We are always given options, and from these options, we are called to make decisions. Each decision that we make and each answer that we give to each test determine our destiny. God never holds the steering wheel of our lives; He only clears the path, gives us signs, and guides us on our way, but it is still always us who are the driver of our lives. But what if I made a wrong turn? What if I made a wrong decision? Am I doomed? Is my life over? We may ask ourselves these questions, but let us be assured that, if we fail in one test, if we made a wrong turn, that doesn't mean that we failed in life altogether. Our God is a God of chances. God never runs out of chances to give to us, whether it's our second, third, or nth chance. He will never grow tired of guiding us as we hold the steering wheel of our lives. So don't fear. Live deliberately. Choose wisely. Take the steering wheel of your life.